Corrosion Control for Chillers | OptiShield Corrosion Prevention Solutions by Opti Temp, Inc. Corrosion Solutions by Opti Temp, Inc. The OptiShield family of corrosion inhibitors has been specifically formulated to control corrosion in systems circulating fluids to industrial machines such as lasers, welders, machine tools and other process equipment. OptiShield is exceptionally effective where copper, tin, ferrous metals, lead, brass and other yellow metals are included in a closed circuit fluid heating/cooling system. OptiShield prevents galvanic action from occurring between any of these dissimilar metals, as well as prevents oxidation of the ferrous metals in the system. 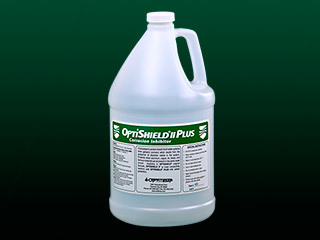 OptiShield is for applications that do not require low conductivity. 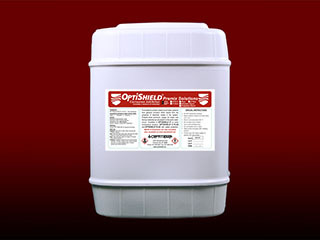 OptiShield II is for applications that require low conductivity. OptiShield Plus is for applications that do not require low conductivity, but has an added ingredient that will provide an unfriendly environment for algae. ingredient that will provide an unfriendly environment for algae. Caution - DO NOT USE OptiShield II Plus if aluminum is in your fluid circuit! Premix products offer an alternative to mixing solutions on site particularly when the locally available water is of low quality or suspected of contamination. 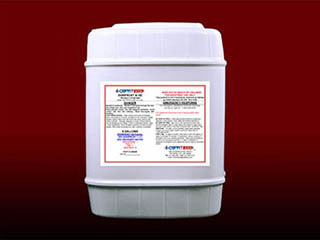 The OptiShield family of products are available in pint, gallon, 5 gallon and larger sizes up to 55 gallons, pre-mix products limited to 1 or 5 Gallon containers. 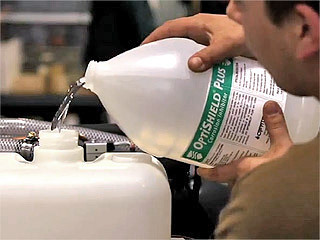 OptiShield Original formula controls corrosion in systems circulating fluid to industrial machines such as lasers, welders, machine tools and other process equipment. 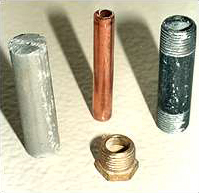 It provides broad corrosion protection for systems with a range of materials including copper, brass, aluminum, tin, ferrous metals, lead, and other yellow metals. OptiShield Plus provides the same corrosion protection as our OptiShield Original formula but contains an additive to provide additional protection. It has been specifically formulated to control corrosion in systems circulating water to industrial machines such as lasers, welders, machine tools and other process equipment. OptiShield II Low Conductivity Formula OptiShield® II corrosion inhibitor has been specially formulated to provide corrosion protection in systems such as laser, welding, induction, and other equipment where "electrical conductivity" of the fluid is of concern. The lower conductivity of OptiShield II allows its use in some systems where protection is not otherwise available due to system/fluid conductivity specifications. OptiShield II Plus corrosion inhibitor has been specially formulated to provide corrosion protection in systems such as laser, welding, induction, and other equipment where "electrical conductivity" of the fluid is of concern. The lower conductivity of OptiShield II allows its use in some systems where protection is not otherwise available due to system/fluid conductivity specifications. Caution-DO NOT USE OptiShield II Plus if aluminum is in your fluid circuit! Premix OPTISHIELD® containing 10% OptiShield and 90% RO water is available in 1 gallon and 5 gallon sizes. Offer an alternative to mixing solutions on site. 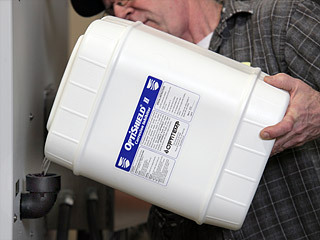 Premix OPTISHIELD® containing 10% OptiShield, 60% RO water, and 30% Propylene Glycol is available in 5 gallon containers. Offer an alternative to mixing solutions on site. 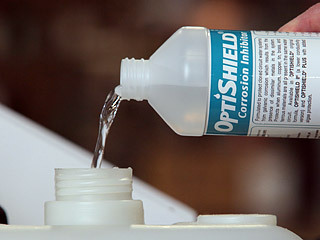 "Preventing Corrosion in University Labs"
OptiShield corrosion inhibitor is a water-based liquid additive specially formulated to protect closed-circuit process heating and cooling systems from galvanic corrosion, which results from the presence of dissimilar metals within the recirculating system. The OptiShield corrosion control products have excellent heat transfer characteristics and are normally classified as “non-hazardous." Closed-circuit heating and cooling systems often contain various dissimilar materials such as copper, brass, aluminum, tin, ferrous metals, lead, brass, and other yellow metals. 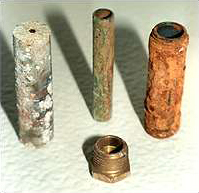 When dissimilar metals are present within an untreated system, galvanic corrosion normally results, due to differences in the electro-chemical potential of the materials. Left untreated, galvanic corrosion often leads to pump/seal failures, reduction in heat transfer efficiency, reduced flow, lost revenue, associated downtime, and expensive cooling system repairs. OptiShield inhibitors are very effective in controlling galvanic corrosion in recirculating systems. The photograph below shows fittings immersed in water treated with OptiShield, and fittings immersed in untreated water. "Core Protection for Liquid Chillers"